Remarkable saints and teachers of spirituality have appeared regularly on the Indian subcontinent over the last many centuries. 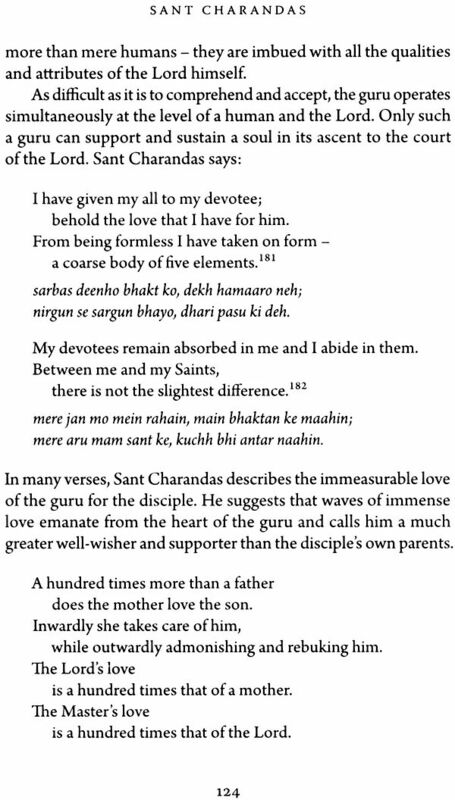 With this book, Sant Charandas, we present the teachings of a saint who holds a place of high regard in that illustrious gathering. 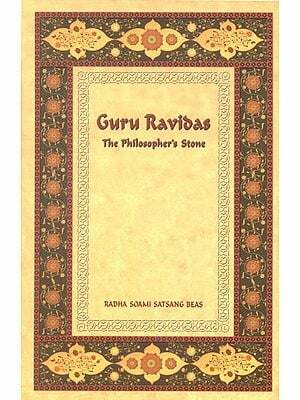 First published in Punjabi and Hindi by Radha Soami Satsang Beas in 1992, this new work presents, for the first time in English, the life and teachings of Sant Charandas along with a selection from the vast amount of poetry he wrote. 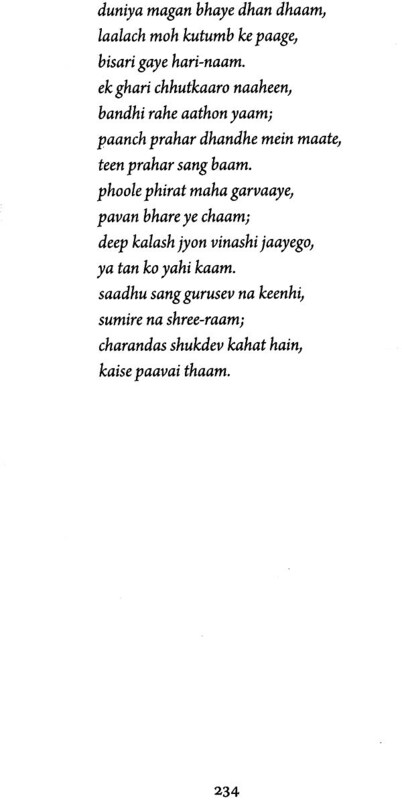 We present transliterations of the original Hindi poetry along with its English translation to give readers familiar with both languages an opportunity to enjoy the saint's compositions in their original version as well as in translation. The format we hope will prove useful to anyone wishing to use the book as a primary source for further study of the saint and his writings. What we learn from historians about a particular place and time often causes us to reflect on our own present circumstances. So it is with eighteenth-century Delhi, the city in and around which Sant Charandas spent most of his days and accomplished the majority of his life's work. Wars, moral decay, violence and political power struggles were the order of the day. As contemporary citizens of a tumultuous world, we can identify with what it would have been like for an ordinary person struggling to survive in that troubled environment and to have been thrown a lifeline of hope in that sea of despair. 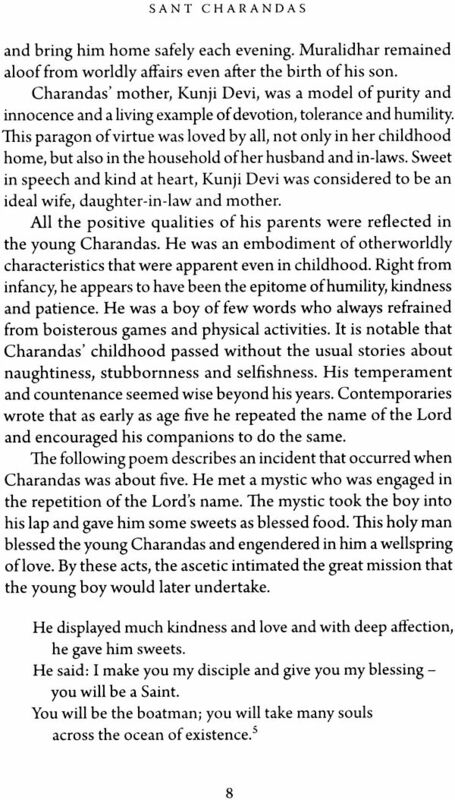 The message Sant Charandas gave to the multitudes who heard him - primarily common people but also kings and nobles - was simple. 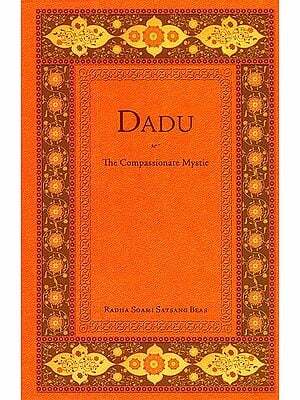 He taught that the Lord has given us a way out of the miseries of the endless cycle of death and rebirth; he has placed Shabd, the power that created and continues to sustain all life, in every living being; and he sends living masters to show the way out through the practice of meditation. 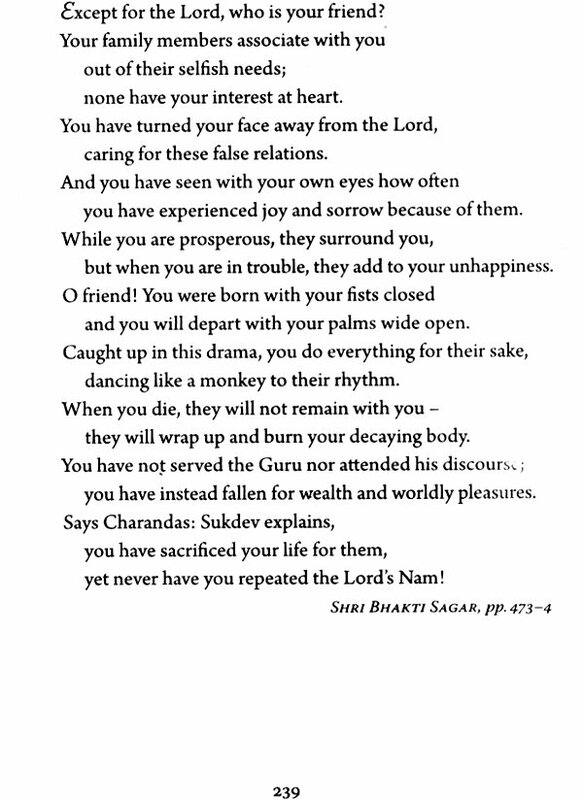 Sant Charandas spoke to his audience bluntly about the truths of the human condition: the pretension and falsity of the world; the fleeting nature of life; and the need for a living master as an intermediary and guide between the human and the divine. 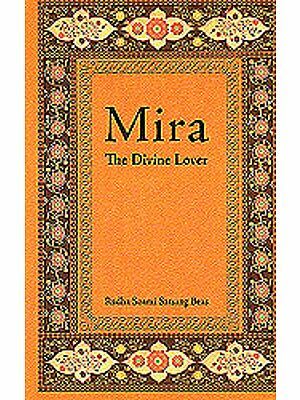 His tone has a sense of urgency as he implores his listeners to devote their lives to meditation on Shabd, on Nam, as the only way to fulfilment of the purpose of human life: self-realization leading to God-realization. 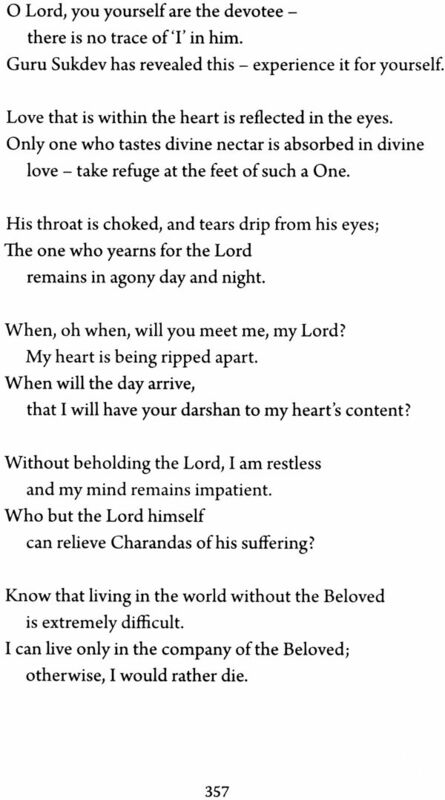 The voice of Sant Charandas travels across time to us today through the continued relevance of his poetry. His message, we submit, cannot be heard too often. 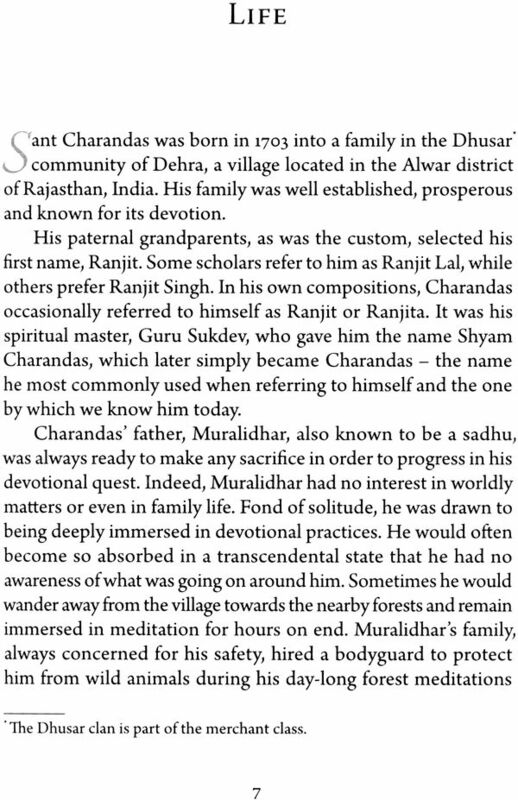 It is our hope that this publication, presenting Sant Charandas' clear, honest and practical spiritual teachings, will stimulate a growing readership of admirers of Sant Charandas and will appeal to the spiritually hungry within India and beyond. The lives of saints so often seem pure and undefiled in comparison with the social settings in which they lived. This contrast is even more striking in the case of Sant Charandas, who lived from 1703 to 1782 AD. He spent most of his life in and around Delhi during a period of political, religious and moral decay. During the short span of so years after Aurangzeb's' death in 1707, seven kings successively ruled the disintegrating Mughal Empire from Delhi. These rulers spent most of their time waging bloody wars to secure or keep their thrones. Greed, treachery and opportunism created an atmosphere of brutality, plunder and insecurity not only in the palace, but also in the streets of the capital. The royal court became an arena for murderous intrigues to gain political power and wealth. 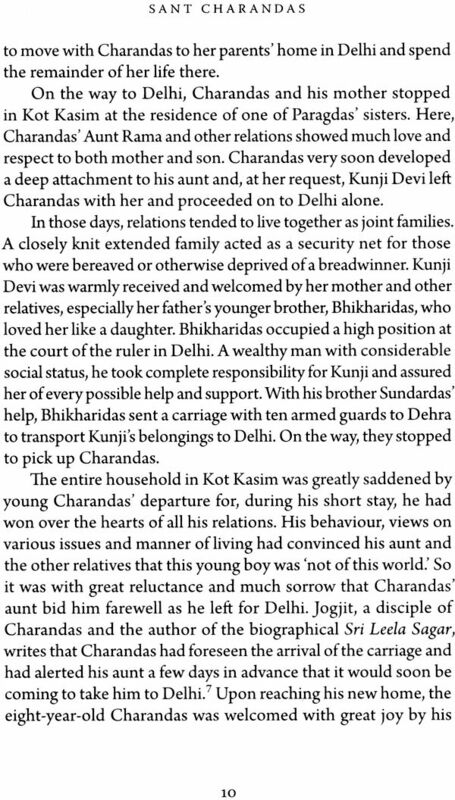 No king could trust his own sons or other relatives, and their ministers, advisers, army commanders and provincial viceroys were equally untrustworthy. Many communities - Jats, Bundhels, Rajputs, Marathas and Sikhs - challenged the royal power and continuously fought against the Mughals. In addition, the country suffered bloodshed and pillage from invasions by Nadir Shah from Persia and Ahmad Shah Abdali from Afghanistan. Aurangzeb, a religious fundamentalist, had exacerbated the situation in his time by persecuting Hindus and destroying their temples. He also executed Guru Teg Bahadur, the ninth Sikh Guru, and the Jewish saint Sarmad. While compassion and love are the foundation of spirituality, the dogmas supported by successive rulers generated the poisons of cruelty, violence and hatred, creating a religious environment characterized by conflict and dissension. Not only were followers of various religions pitted against each other, but even different sects within the same religion sought each other's blood. 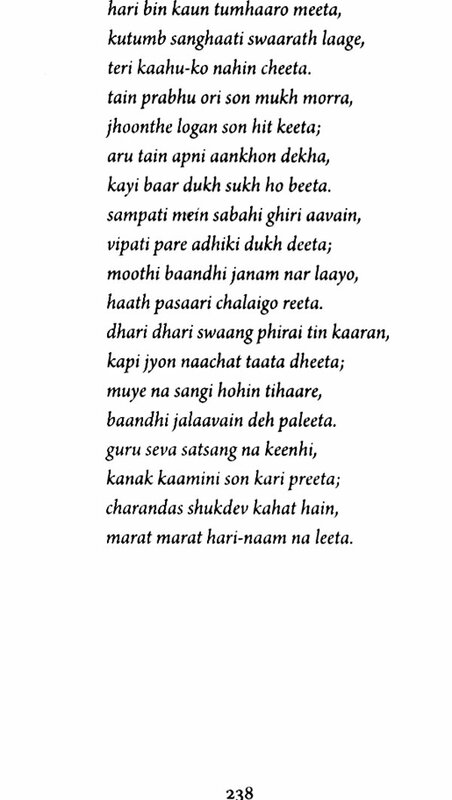 While there was no dearth of priests, sect leaders, yogis, siddhas and sadhus, arrogance, ritualism and deception prevailed everywhere. This was the environment in which Charandas had to do his work. 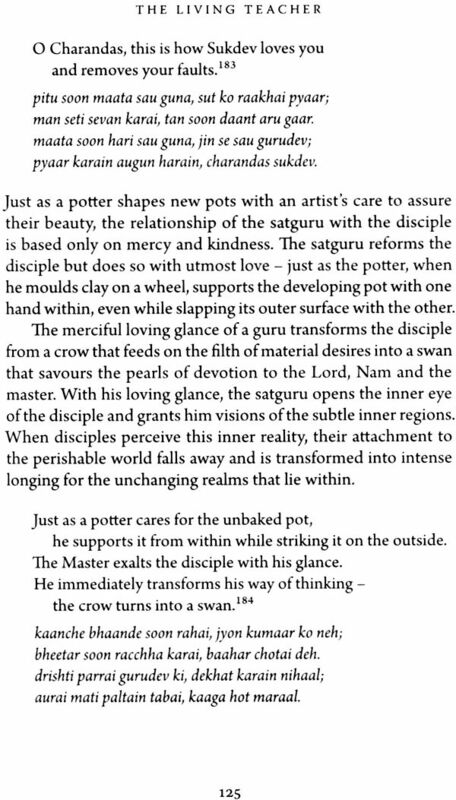 In the midst of this political turmoil and strife, Sant Charandas expounded on the common thread of spirituality that forms the core of all religions - the simple path of devotion. His teachings embraced people of all backgrounds and religious denominations: Hindus and Muslims, rich and poor, men and women, householders and ascetics. All received his love, compassion and support in equal measure. Historians say that his disciples included people drawn from all four castes of Hindu society. Hundreds of Muslim devotees attended his discourses, many of whom were granted initiation and became his disciples. Ascetics, hermits and yogis representing different sects and philosophies all sought his company. Sant Charandas taught that the light of the Supreme Being is manifest within each of us, and thus all humanity has the right to the same honour and respect, regardless of their background. No one should be considered either high or low. 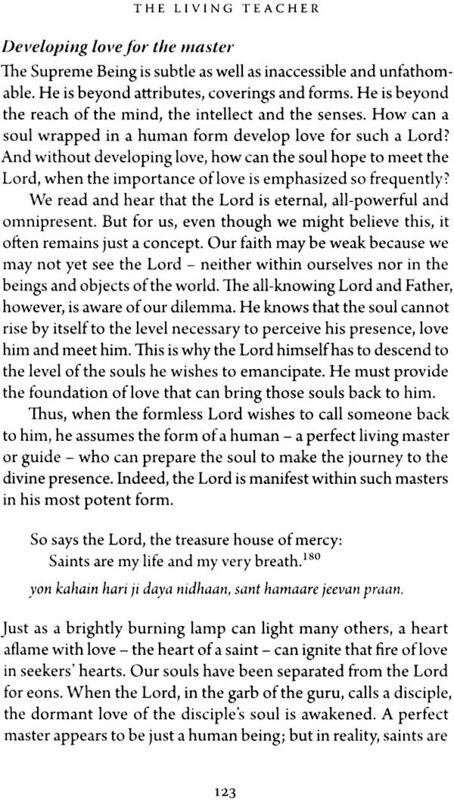 He placed utmost importance on the fundamental truths that the way to reach the Supreme Being is to contact him directly within one's self, that no outward practice or ceremony is of any avail, and that the only thing necessary is to take one's attention inside and connect it to Shabd' and the Lord. 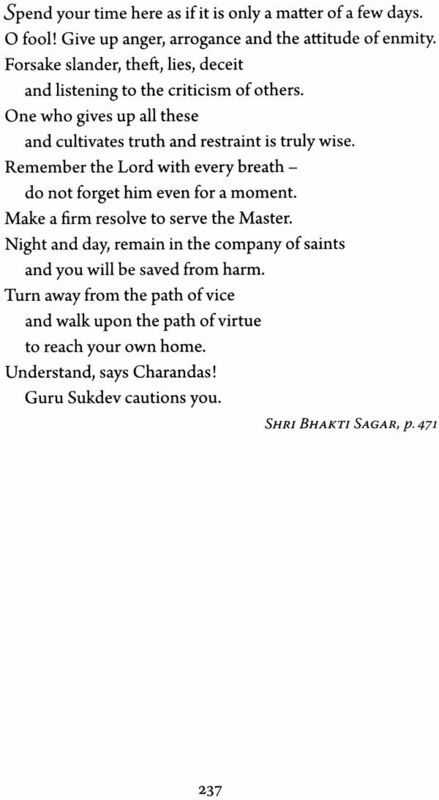 Although Sant Charandas himself never married, he openly affirmed that the domestic life of a householder was not an obstacle on the path of devotion. He never left people in any doubt about the possibility of attaining the Lord while leading either a householder's life or the life of a renunciate. He always taught the highest principles of morality) encouraging his followers to refrain from the misuse of wealth) and emphasized the benefits of honest living. He laid great stress on the importance of piety in conduct and maintaining a high moral stance. Sant Charandas opposed violence. He regarded slander) callous criticism and harsh words to be forms of aggression and taught that killing) sacrificing living creatures and using meat in any manner were great sins. For this reason) followers of the Charandasi sect have always stressed the importance of behaving kindly towards all living things. 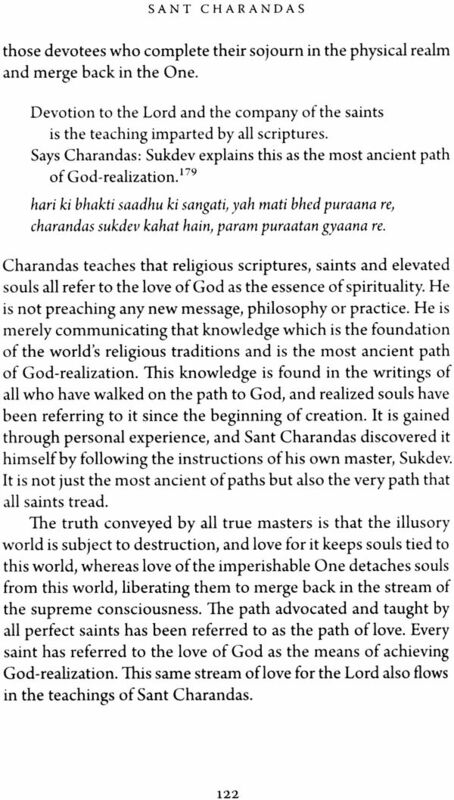 The spiritual path taught by Sant Charandas is primal and universal and is the same path that is taught by all enlightened mystics since time immemorial. Yet this path needs to be re-established periodically because we tend to forget the core of true spirituality and instead associate with rituals - performing external practices and establishing organized religions. 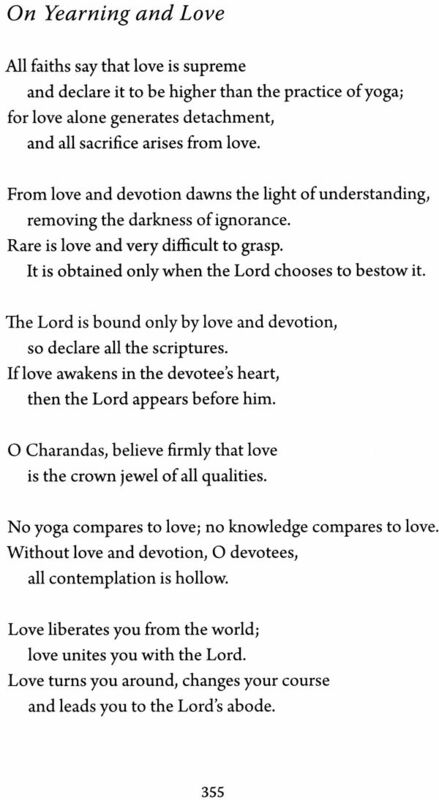 Sant Charandas inculcated in his followers' hearts such a deep love for the Lord that it became the basis of love for all living things) including all of humanity. He taught that the path of devotion to Nam - also known in other traditions as the Word, Holy Ghost or Name, Ism-e-Azam, Kalma, Logos, Nad or Shabd - is the only way back to the Supreme Being and the very path that is the foundation of all religious beliefs. It can be difficult to accurately write about the teachings of saints and mystics because their original works are not often available or accessible. Chronicling their lives may be even more challenging when there is no reliable material whatsoever. Fortunately, this is not the case with Sant Charandas. His writings on a remarkably wide range of topics have been compiled in the volume entitled Sri Bhakti Sagar, and his exemplary life began to be discussed even while he was still living. 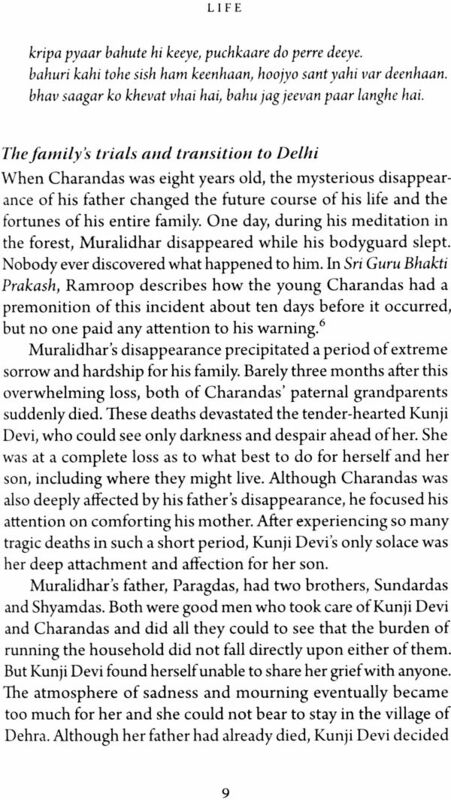 Shortly after his death, three of his disciples - Ramroop, Jogjit and Jasram Upkari - wrote Sri Guru Bhakti Prakash, Sri Leela Sagar and Bhakt Bavni, respectively, to describe the life and outline the teachings of Sant Charandas. 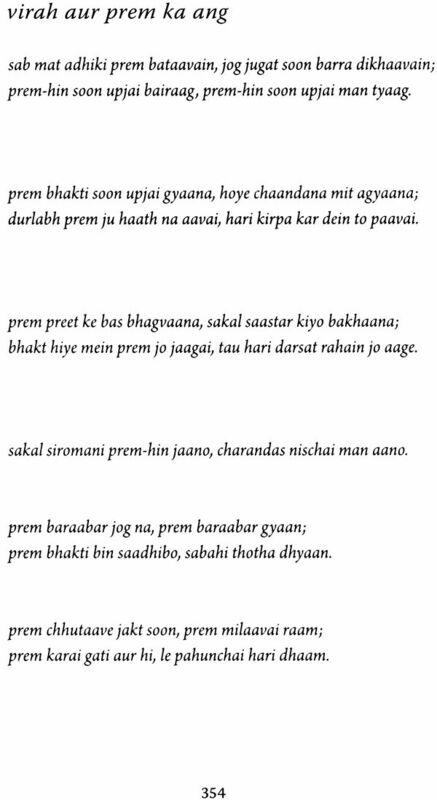 Sahjobai, a well-known disciple, included details of his birth, parentage and family in her poetry. Such writings continued from the time of his death in 1782 until the middle of the nineteenth century. 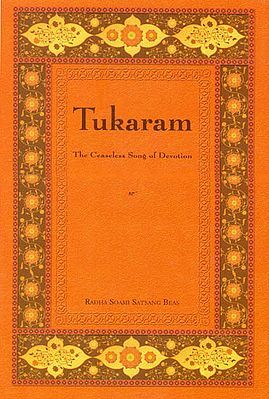 The several hundred poets associated with Charandas' name and teachings are known as the Charandasi or Shuk school, and their published and unpublished writings are said to number in the thousands.